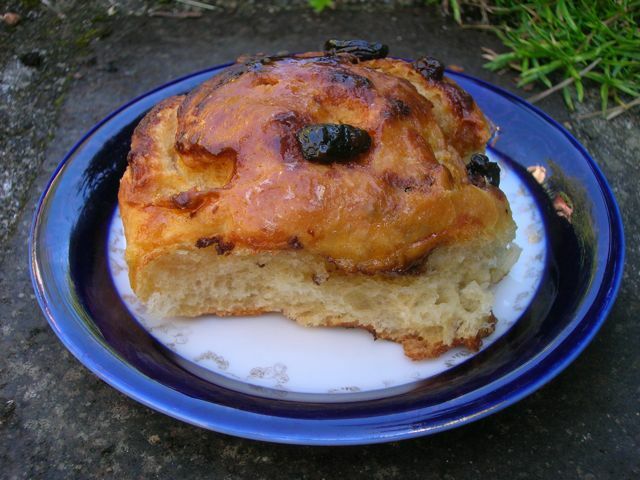 These sweet and sticky buttery fruity yeast chocolate Chelsea buns are a real treat. They’re studded with the usual raisins, but also dark chocolate to give extra depth of flavour and delight. Last week, I accompanied my mother to the bakers to buy some fresh yeast to make bread. She only wanted 1½ oz, but as they didn’t have any half ounce weights, she was only able to get 2 oz. It’s been a while since I made yeasted bread. The figgy bread roll I experimented with back in May was probably the last one. These days, I tend to stick to my weekly sourdough. So, on the spur of the moment, I said I’d relieve her of the extra ½ oz. Home I went, wondering what on earth I could make with ½ oz fresh yeast. I did what I suspect most of us would do and turned to Google. Three pages into the search, I was about to give up, when I spotted a recipe for Chelsea buns in amongst all the comparisons of the fresh and dry yeast equivalents. Marvellous, I thought: I’ve never made Chelsea buns before and I’ve never eaten chocolate ones at all. I’d been given a bar of dark chocolate with cranberries for my birthday and I thought this would be just the thing for these chocolate Chelsea buns. What can I say, they were very good and didn’t last as long as I’d planned. The chocolate proved to be an excellent way of counteracting the sweetness of the buns and adding a richness of flavour which was very welcome. They were definitely at their best on day one when the dough was soft and brioche like. By day two they had toughened, still good, but not as delicious. Note to self: remember to eat the whole lot on the same day next time. As this recipe was entirely made from scratch, I’m sharing these chocolate Chelsea buns with Javelin Warrior’s Made with Love Mondays. Chocolate Chelsea Buns. PIN IT. Sweet and sticky fruity buttery yeast pastries studded with dark chocolate to give extra depth of flavour and delight. Melt 25g butter in a pan and remove from the heat. Add the milk and crumble in the yeast. Stir until smooth. Place the flour and salt in a bowl. Make a well in the centre and poor in the milk. Add the egg and mix with a large metal spoon until combined. Knead for about 10 minutes. It's quite a wet dough but I oiled my work surface rather than flowering it. Place the dough back in the bowl, cover with a plastic bag and leave in a warm place for an hour or so until doubled in size. Gathered the dough and rolled into a large rectangle on a floured surface (about 30 x 23 cm). Melt the remaining 15g butter and brush over the surface. Mix the sugar, raisins and dark chocolate and spread over the dough, leaving a 1 cm gap around the edges. Roll the dough up as tightly as possible on the long side. Seal the edges and cut into 12 slices. Place onto a lined baking tray or in my case a 23 cm square silicone mould. Cover and leave in a warm place to rise for another hour or so until doubled in size. Bake at 190℃ (375℉, Gas 5), for about 30 minutes until golden brown. Warm some honey and brush over the hot buns. Turn out onto a rack to cool. My oh my they look stunning. I do love the fluffy open texture if a Chelsea bun and you’ve totally captured that with these beauties. Shamefully I’ve never used fresh yeast something I must remedy. Fab inspiration! Thanks Dom. These were fluffy and delicious on day 1, but disappointingly went a bit hard on day 2. I think they needed warming in the oven, but we were in too much of a hurry! You should be able to buy fresh yeast from any baker if you do want to give it a try. Oh Angela, I did and it was definitely the best one. Haven’t had a chelsea bun in ages and never even tried to make them. def need to have a go sometime as these look lovely. Thanks Gary – sweet yeasted buns aren’t quite as easy as bread, but not that difficult either and definitely worth trying. I love Chelsea buns and made my first batch not long ago, have never tried them with chocolate before though. These ones look lovely and I like the combination of the dark chocolate with cranberries, yummy! Thanks Jen, you know me, I have to try everything with chocolate. Luckily, it worked really well. These sound so good, what a great way to use up that yeast! I made some chocolate, banana and caramel chelsea buns earlier this year, they looked nowhere near as good as yours! Thank you, but oh but Caroline, yours sound divine. I love sweet rolls but I’ve never tried adding chocolate to them! These sound delicious, Choclette – especially with the addition of a bit of cranberry. A perfect sweet breakfast or dessert! 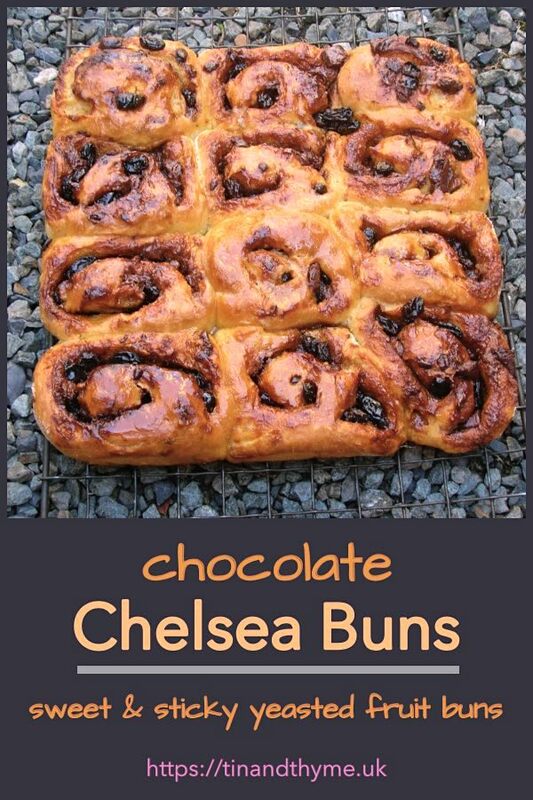 I love Chelsea Buns, and what a brilliant idea to add chocolate to them. They look so good. Definitely one to try. Did you ever try them Snowy?